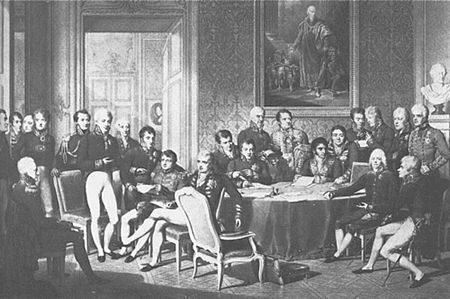 Following the exile of Napoleon Bonaparte to Elba, the victorious Allied powers began a series of committee sessions in Vienna to sort out the problems of Europe. The Big Four were Britain, Austria, Prussia and Russia, although the newly royalist France was invited to join later. The key thing in the minds of the Allies was to organise a peace that would bring stability to Europe and contain, but not punish France. In a bid to improve the status of Louis XVIII, the Allies decided to avoid imposing damaging reparations on France and allowed her to keep her former colonies. Within Europe, she was forced back to her 1792 borders, which effectively meant the loss of only the Low Countries. While a workable peace was the ultimate objective, the Allies also wanted to restore the legitimate rulers of Europe to their pre-1792 thrones - but not at the expense of disrupting the balance of power within the continent. The issue of minor nationalities being able to decide their own fate was also an important consideration. France's representative at the Congress, Charles Talleyrand-Perigord, was at his politically savvy best during the meetings and brilliantly worked on the distrust the Allies had for each other. His task was made easier by Prussia and Russia's plans for Saxony, which basically meant the former annexing the country in exchange for Russia gaining three-quarters of the Duchy of Warsaw. Austria would be thrown the remainder. This, of course, made Austria nervous of a far stronger Russia and so Vienna sought a secret military alliance with Britain and France while mobilising its troops. The spectre of renewed war in Europe, particularly between former allies, was enough to bring sense to the negotiations and they resolved the issues with more open minds. Saxony was to remain independent under its formerly pro-Bonapartist King Frederick Augustus, although he had to give Prussia one third of his territories. The obvious distaste felt by the Saxon king can be realised in that it took three months for him to agree to the ceding of the lands. The Duchy of Warsaw became a subject kingdom under the Russian Tsar, Holland was created and incorporated Belgium, while Austria regained control of various Italian territories. The return of Bonaparte and his triumphal move on Paris sped up the Congress's progress, although the final document was only signed nine days before the battle of Waterloo. While it dealt with the restoration of what was hoped would be stabilising monarchies, by not dealing with the issues of nationalism the Congress sowed the seeds of a new revolutionary period. And much of the Prussian distrust towards Britain in the 100 Days' Campaign stems from London's secret alliance with France and Austria.